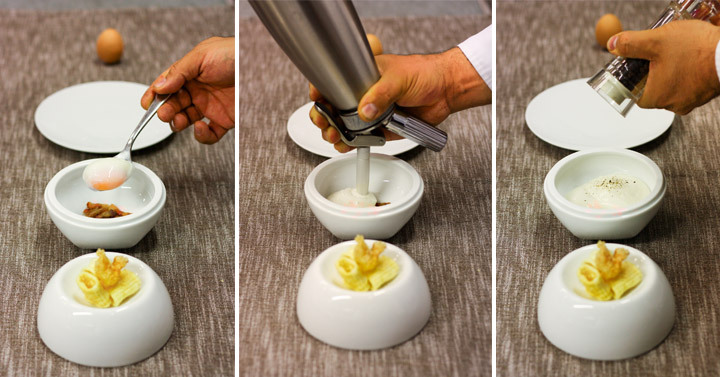 This innovative egg carbonara by Chef Roy Caceres of Metamorfosi restaurant in Rome will remind you of the flavors of a traditional carbonara but it is completely different in texture and presentation. 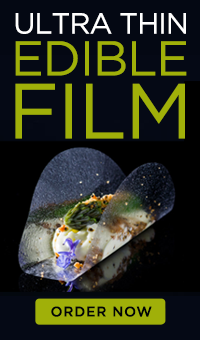 This is one of Metamorfosi’s most popular dishes and Chef Caceres shared this magnificent recipe with us. 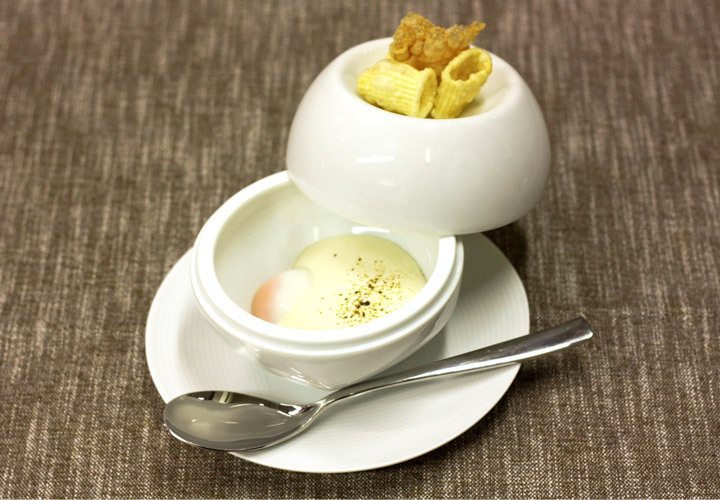 The creamy egg is perfectly cooked sous vide at 65° and accompanied by crispy guanciale, crunchy chicharon, fried pasta and a playful Parmigiano foam to finish it off. 1- Overcook pasta such as rigatoni in boiling water for about 40 minutes. 2- Remove pasta from boiling water and place it in an ice bath to cool it down. 3- Let dry in a dehydrator at 45 - 50°C (113 - 122°C) until it’s almost dry. 4- Finish by flash frying in oil at 190°C (383°F). 1- Cook pork skin in a pressure cooker for 1 1\2 hours. 2- Cool on ice and remove excess fat. 3- Dehydrate at 80°C (176° F) until dry. 4- Finish by flash frying at 190°C (374°F). 1- Cook the eggs in the Roner or sous vide water bath at 65°C (149° F) for 40 min. 2- Cool in ice water and set aside until serving time. 1- Heat the cream in the Thermomix or pot to 60ºC (140° F). 2- Add the Parmigiano and mix at the maximum speed until it is a smooth cream. If you don’t have a Thermomix, use an immersion blender. 4- Add the egg whites and season with black pepper and nutmeg. 5- Pass through the iSi funnel and sieve and pour into a 1L iSi Whip. 6- Charge the 1L iSi Whip with two charges and shake. 7- Keep until time to serve heated at 70°C (158°F) in the Roner, sous vide water bath or bain marie. 1- Reheat the eggs in sous vide water bath at 65°C (149°F) for 10 minutes. 2- In a skillet, slowly brown the gaunciale. Remove the excess fat before placing in bottom part of the serving dishes. 3- Place the pasta and the chicharon with a little Parmigiano in the hot oven for 2 minutes until cheese is melted. 4- Put pasta and chicharon in the top half of the dishes. 5- Open the cooked eggs and put them into the bottom half of the dishes with the guanciale. 6- Finish by adding the hot foam, some Parmiggiano cheese and a little ground coarse black pepper on top of the egg as garnish. Thanks again for generously sharing your recipe with us Chef Caceres!